Listen up Beardtopians! I know most of you either have a beard or know someone that does. So here is an opportunity to put those beards to good use. It’s called the Beard Pageant. It’s your basic beard/moustache contest with a couple twists. In addition to the “hairy” categories, there is also a talent category and also a photoshop/image manipulation category (no facial hair required!) . For the photoshop category, the only beard that is required is the one that you put on some photo in a creative/funny way. All of the entries will have a social vote and a judge vote. There will be cash prizes for the winners and runners-up ($10-$50). The winners will be announced at the finale at Paschall Bar. The deadline to enter is March 9. Also, the best part of this Beard Pageant is that ALL of the proceeds will go to a Denton charity. And it’s only $5 to enter for each category! Talent contest. Contestant must have a beard/moustache and their face must be visible and identifiable. Videos required. Submit links only, no files. Must be uploaded to one of the following: Facebook, YouTube, Vimeo, or Google Video. Video must be between 5 seconds and 3 minutes. This is a contest of pure size. All measurements will be considered, but length, from tip of chin to tip of beard, will factor most heavily. This is a “Photoshop™ contest”, judging the quality/humor of Photoshopped or digitally-modified images of beards on people/things that don’t have them in real life. Quality of work, humor and tastefulness will be considered. Overall best moustache, that does not take any present beard into consideration. This is for the most interesting non-traditional beard. Dyed, braided, dreadlocked, or enhanced beards would fall into this competition. Color, style, artistic quality, humor, beauty, shape and size would all factor in this category. A contest of celebrated beards. The celebrities will be chosen by panel, and though there will be no popular vote, the winners will be chosen by a combination of judges’ votes and pure chance. Just for fun. So anyway, I didn’t get approved for a press pass this year. Therefore, I will not be taking photos or video at 35 Denton . 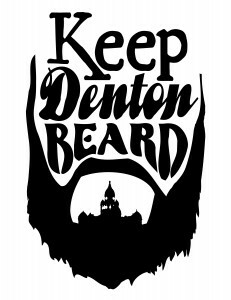 Here is my take on a Keep Denton Beard logo that you can all use for whatever you want. Download the high-res vector graphic here! Get shirts made, stickers, hats, whatever you want, it belongs to Denton! I have been thinking a lot lately about what exactly it means to “Keep Denton Beard”. 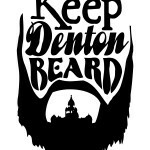 Sure, growing a beard and living in Denton is a way to literally “Keep Denton Beard”. And there will probably always be beards aplenty in Denton (my own included), which is why many laugh and nod when they hear that phrase – they understand that, hey, Denton’s got a lot of bearded men. But what about the beardless women and children of Denton? Or the men who are incapable of (for one reason or another) growing a beard? Are we limiting the identity, the heart and soul of Denton, to just a select group of hairy faced men? Are we proposing that all should be bearded? That we should work hard to get some kind of beard (fake or otherwise) on every good citizen of Denton? Though I do appreciate the beards of Denton and love that many of us have beards, I don’t think that the true heart of “Keep Denton Beard” is the literal face-beard of the men that decide to grow one. At least, I don’t want it to be merely that. It may have started as such, but I want to propose that we give it a deeper meaning, to make it more of a metaphor and perhaps more poetic. To keep Denton “Beard” is a philosophy of a quality of life that can be found in Denton, particularly found around downtown – and I believe that this “way of life” aims to be the truer heart of Denton and it needs to be preserved and cultivated. I may need to spend a little more time thinking about it, and even have more Beardtopians weigh in with their ideas to get a more accurate definition, but I will do my best to explain a little part of what I think it is. In a few words, I think the philosophy is this: the amicable, unhurried, disentangled engagement and enjoyment of the local culture, history, beauty, businesses, and community of people. This is, in part, what I enjoy most about Denton, and I want to preserve and cultivate this. So where does the beard fit in to this? Since it is not the social norm, generally speaking (in these modern times), for the average man to have a beard, we associate the bearded image with the likes of philosophers, poets, “wise” men, artists, musicians, and so on. And it seems to me that all have these have a particular undertone of preoccupation: with being so caught up in something else, that they either forgot to shave or thought it unimportant compared to the activity on hand. When I first started to take part in this way of life here in Denton, I got caught up in it and with the community of people here, just staying local – planting roots, sticking around, hanging out, and enjoying the very heart of Denton. I was so absorbed by this that I felt no need to shave, and even forgot about it. And thus my beard was born and still remains. Understanding the Denton beard in this way, I think it is easier now to see it as less of a laughable observation and more of an important metaphor of a quality of life – engaging in and enjoying the heart and soul of Denton. To pursue this, to preserve it, to seek it out, and to encourage others to participate in it – this is what it means to “Keep Denton Beard”. 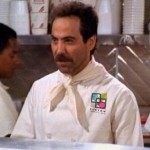 Therefore, my fellow Beardtopians – men, women, and children alike – take part and “Keep Denton Beard”.